Space is the next business frontier. The challenge is in finding a practical method to transport goods, equipment, and resources from earth to orbit. 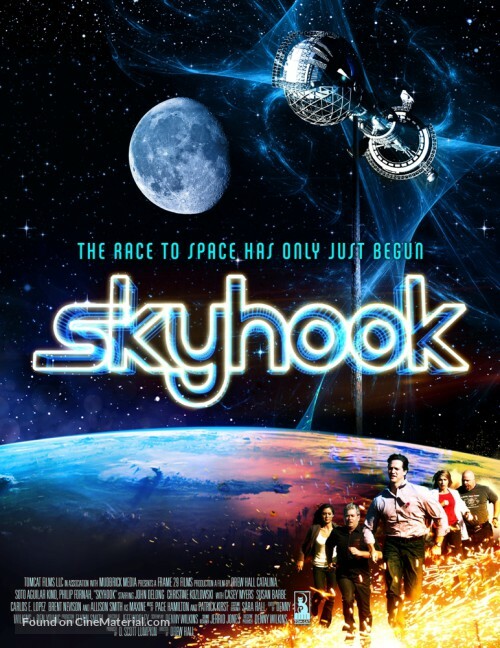 In SkyHook, a team of brilliant scientists compete to build the worlds first space elevator and find themselves up against an evil corporate mercenary in this science fiction espionage thriller. Jan (Catalina Soto-Aguilar) is a material science expert who is blackmailed by the nefarious Jamal (Philip Fornah) to steal designs from the SkyHook team who are competing for the Bonner Space Prize of $1,000,000,000. Jan strategically positions herself at the SkyHook team’s favorite bar and begins to infiltrate the group, initially as an enthusiastic scientist, but soon finds herself drawn relationships with the team. Her ‘employer’, Jamal, observes her budding romantic relationship with Dr. Jack Baily, the projects second in command, and instructs Jan to pursue an in depth relationship with him. The SkyHook team welcomes Jan in as they are strangers in a strange land – due to the geographical needs of the tether deployment cable, they are based in Guayaquil, Ecuador. The closer the team grows to Jan, the more she is able lift from them, until Jack finds out about her theft. He alerts the team and they quickly attempt to recover from the tragic loss of data, designs, and broken hearts. Meanwhile, Jan finds herself torn between her allegiance to her new friends at SkyHook and the persuasive threat that Jamal holds over her. Her Father, Ian Baker, is one of the world foremost authorities on modern material science. In order to get ahead in the competition, Jamal has taken him captive and continuously reminds Jan of his fate if she doesn’t comply. While the SkyHook team continues to pursue their dream of building the worlds first space elevator, Jamal continues his attack in an attempt to secure the 1 Billion dollar Bonner Space prize and control the fate of the space industry. Jan must decide between the fate of her father and her friends.